The Gloster Canaries With The Beatles Haircut. The oh, so cool, Gloster Canaries...You know, the canary birds with the Beatles haircut. The Gloster Canary is often confused with the Crested Canary. 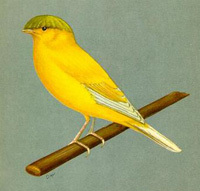 Although the Gloster does have a "crest"...there is a separate breed of canary--also with a crest--called the Crested Canary. The Glosters were bred to be small--short and stubby--no longer than 4 3/4 inches. For years the Glosters were being shown along side other Crested Canaries but finally in 1925 were recognized as a separate breed of canary. Although a Type Canary --and not bred for singing--the Gloster is known to have a beautiful song. That song, combined with the fact that he sports the "Beatles Haircut", and being small and cute, the Gloster has become very popular. Due to some kind of "genetic glitch" a Corona should never be bred to another Corona...low chick survival is the outcome. Corona and Consort are generally bred together but Consort to Consort is another alternative. Read what some have to say...Click here. Find a breeder of Gloster Canaries...click here. To find out more about the Gloster visit the National Gloster Club . Hey, Gloster owners, add your photos, comments, canary care tips, and photos below. We'd love hear from you!